I had a hard time naming this Cottage Pie because I think a lot of Americans will more likely know it as Shepherd’s Pie. However, technically when made with beef it is a Cottage Pie, while Shepherd’s Pie is made with lamb. I think in America we generally use the term Shepherd’s Pie to mean either, so I was walking the line between not wanting to offend any Brits nor confuse any of my fellow Americans. Hopefully we’re all on the same page because regardless of what you call it, this dish is a quintessential comfort food. The bottom layer is hearty ground beef and vegetables in a savory brown gravy and it’s topped with a thick layer of mashed potatoes and cheese. It’s super filling and satisfying and perfect to warm you up on a cold winter day. Cottage Pie is pretty simple and straightforward to make, but it does a bit of time, so it’s great as a weekend dinner or a Sunday supper to leave leftovers for the next few days. If you’re a good multitasker, you can definitely cook the meat and potatoes at the same time to make things more efficient. I really think this is a meal the whole family will love and it’s only 358 calories or 9 Weight Watchers SmartPoints per serving! Mr. Bites (my husband) and I just returned from a trip to London and I really wanted to make a traditional English dish as an homage to our time there. I’ve been wanting to make Cottage Pie or Shepherd’s Pie for the blog for a while now so it seemed like the perfect opportunity. We had an amazing time overseas and I hope this recipe is a fitting tribute! Looking for more lightened up comfort food casserole recipes? Check out my One Pot Cincinnati Chili Bake, Cheesy Buffalo Chicken Potato Bake, Layered Chicken Enchilada Bake, Chili Cornbread Bake, Teriyaki Chicken and Rice Casserole, Beef Enchilada Quinoa Bake, Bubble Up Chicken Pot Pie Casserole, Cheesy Chicken, Broccoli and Rice Casserole, Bubble Up Pizza Casserole, Chicken Cordon Bleu Pasta Bake and many more in the casserole section of my recipe index! Place the ground beef in a large walled skillet or saute pan and bring over medium-high heat. Cook, breaking the meat up into small pieces until browned. When the meat is cooked through, reduce the heat to medium and add the onions and carrots. Stir to combine and cook for 8-10 minutes, stirring occasionally, until the vegetables are soft. Sprinkle with salt and pepper to taste. Add the peas and stir together. Cook for another minute and then add the garlic, flour and tomato paste. Stir to combine and cook for a minute until the flour is blended. Add the broth, Worcestershire sauce, thyme and bay leaves and stir together. Bring to a simmer (this happened quickly for me) and reduce the heat to low. Simmer uncovered for 8-10 minutes, stirring occasionally, until the sauce has thickened and is coating the meat and vegetables. Remove the bay leaves and transfer the mixture into the bottom of a 9×13 casserole dish. Spread evenly and set aside. Pre-heat the oven to 425 degrees. Place the chopped potatoes at the bottom of a large pot and cover them in salted cold water. Place the pot on the stove, covered, and bring to a boil over high heat. Once the water is boiling, cook the potatoes for about 5 minutes and then drain the water. Spread the potatoes out on a clean, dry surface for about 5 minutes to allow the steam to escape. Transfer the potatoes to a mixing bowl and mash them until smooth. Add the butter, milk and about ¾ of the cheese and stir/mash until well combined. Add some salt and pepper to taste. Transfer the mashed potatoes to the casserole dish, spreading them in an even layer over top of the meat mixture. Sprinkle the remaining cheese on top. Place the dish in the oven and bake for about 30 minutes until the casserole is cooked through and the mashed potato peaks start to turn golden. I hate to critique, but this is a sticking point for both myself (who lived in the UK for 4 years) and my Welsh husband who grew up in the Midlands. A true traditional cottage or shepherd’s pie DOES NOT have cheese in it or on it. Yum! This looks amazing and very kid-friendly! Thanks Lisa! I hope you try it and love it! Okay, I appreciate your nice words but hopefully I can ward off more people piling on by just saying okay, YOU ARE RIGHT AND I AM WRONG! Probably! I’m really not trying to get into a debate about this because all I care about is whether it’s delicious or not. I’ve seen plenty of these pies with cheese and like I said, I adapted this one from the BBC and the Cottage Pie I ate in England did have cheese on it so I really couldn’t have predicted I would get criticized about this. I took care in titling this recipe to avoid offense or controversy but it seems I’ve still managed to do so and it’s a bummer. I am not an expert in the history of all regional and ethnic food dishes and I have TONS of quasi-ethnic recipes on my site that do not follow the original or authentic preparation. To be 100% honest, I generally am not that worried about it. I am just trying to bring people delicious lightened up versions of their favorite comfort foods. What can’t be improved with cheese, am I right? I really don’t want to offend anyone and it’s frustrating that I somehow seem to have done so. As a Buffalonian, I am aghast when people use ranch dressing with their Buffalo wings or Buffalo chicken recipes, but at the same time, I get that they’re probably just trying to make something they like or their reader’s will like and not really worried about preserving the authentic sanctity of wings with blue cheese. I hope you can forgive me for putting cheese on my cottage pie and offer me the same courtesy. If you decide to try the recipe, feel free to leave off the cheese! If you don’t like cheese on cottage pie, don’t put It on. No need to criticize or even comment about it at all! Emily, I appreciate all your recipes and the time you take creating new recipes and maintaining your blog. This recipe looks delicious, can’t wait to try it! This recipe sounds so good and I will be making it this week for sure – exactly the way the recipe reads. We are a Weight Watcher family and I can’t tell you how much I appreciate your talent in creating food that tastes so good and I don’t have to feel guilty about. My family thanks you too – you’re awesome and please keep the recipes coming. Good Lord, people. It’s just cheese. If you don’t want it leave it off, and pat yourself on the back for saving a few extra calories. 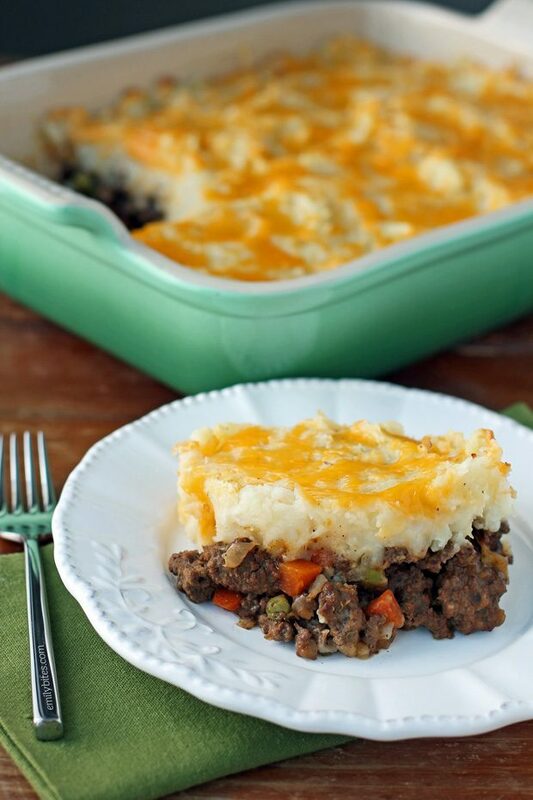 Shepard’s Pie is my favorite, can’t wait to try this! Thanks for your hard work, Emily! Emily, I just made this tonight. It’s delicious! Thank-you! I’ll definitely be trying this next week! And I will DEFINITELY be adding the cheese I’ve never tried cottage/Shepards pie before at all, so this will be my first time! But I agree, everything can be made even better with the addition of cheese! I’m sorry that you felt like you had to apologize Emily, that should’ve never happened! I just want you to know that every single one of your recipes that I have tried has been AMAZING and my 7 year old has also loved the ones she’s tried. I never feel like I’m eating diet food, and I always feel satisfied. So THANK YOU for always trying new things, livening up recipes, adding your own flair, and having such a wide range of cultured food. You are wonderful! I made this on Sunday and it was fantastic! Another winner. I can’t believe all of the upset about the cheese! Geez! If you don’t like it, just don’t do it for yourself, right?! Where is that casserole dish from?? I’m in love! I come up with 11 points and I can’t for the life of me figure out why. I built the recipe on the weight watcher’s page. Is it just me? I’m sure I’m doing something wrong. Anyways, love your recipes. My family and I are truly emilybites-aholics!! This was really good, I did add some smoked paprika, but I pretty much add that to everything! This is one of my favorite childhood comfort foods. My mom’s version actually has corn in it as well. A perfect all-in-one casserole. Hi Lynette, I think this answer from my FAQs will help you! Hello. Looks amazing! Just a few questions. 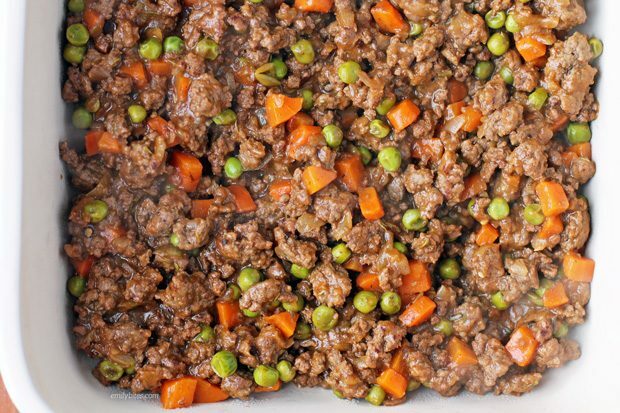 1) Have you tried with ground turkey? and 2) What % milk did you use when calculating? your shepherd’s pie version looks great, full of flavor just how i like it! Emily, I’m trying this tonight and I’m so excited! Also, you did a great job of making it clear in the comments before the recipe that you didn’t want to offend anyone. And to be 100% honest, getting offended over a recipe is sad. There are bigger things to worry about. Hopefully everyone will realize you take time out of her your to post FREE DELICIOUS recipes for us. We should say thank you. P.S…just ate slow cooker kickin chicken pasta for lunch. Quite possibly my favorite pasta. Ever. Thank you!! Tonight we had the second half of this recipe. (I always cook once and eat twice. Only 2 of us, so this recipe made two full meals with leftovers.) In case anyone wonders, I froze the meat mixture and mashed potatoes in freezer bags to save room. When thawed I just dumped them into a square 8×8 pan. I did add 1/4 cup of fat free sour cream (1/2 cup for the whole recipe) to the potatoes this time to add some richness. It made it 10SP instead of 9, but really elevated them for me. I know this is simply a personal choice issue, but wanted to share in case anyone else wants more flavor in your potatoes. Thank you, Emily, for the best Cottage (or Shepherd’s) Pie I have ever made! I truly appreciate your efforts!! Hi Emily! I made this recipe today and it is so good! Sorry it irritated you to have people complain about “real” cottage pie – while it is vaguely interesting to know the history of the dish, I don’t really care. I did make some changes which slightly affected the dish’s nutrition facts but only added 40 calories and made it a little easier on me in the kitchen. 2. I bought baby carrots so I could eat the rest. Whole packets of carrots go bad at my house sometimes so I thought these would be easier to pull out of the fridge and eat with no prep. 3. I used a whole 9 oz box of frozen peas. I never know what to do with the rest of a box when I use 3/4 of a cup for a recipe so I just dumped the whole thing in. 4. I could not find in my terrible grocery store reduced fat cheddar. I used shredded double cheddar by Sargento in the same amounts and I think the recipe turned out awesome. Overall, I think your recipe turned out divine! I made this tonight and it was amazing!! Even my picky toddler couldn’t get enough. I’ll definitely be making it again! Hello, I am beginner cook so I just wanted to verify something, if I may. Do you have to drain the ground beef after cooking it? This looks SO good and I REALLY do not want to mess it up. I made this for dinner last night and my family loved it. Just curious if it would make a good freezer meal? Ok, the “traditional” cottage pie hoop-la cracks me up. Save yourself time and energy Emily-just name it something like “Not so Traditional Beefy Cottage Pie”. No one can complain then, right? LOL I can’t wait to try this one. I love that the ingredients are things I usually have on hand! I like the recipe it contains almost all the traditional ingredients, and adds one. My dilemma now is do I use the cheese, or not? If I don’t, I am traditional if I do I am Americanizing my homelands dish and the Americans have taken everything. Maybe if I used English cheese that would be better? I could always use a white French cheese and hide it in the mash. But then am I slamming the French for hiding in the war? And if its beef why is it cottage pie? I mean its Shepherds pie for Lamb, but cottage for beef. I don’t keep a cow in my cottage. This is so frustrating, I am going out for a Kebob and think about my sins. Thanks for the recipe and the Great Cheese debate. (In my house we don’t use cheese on it bye the bye. I am half English. I use an egg glaze on the mash to get the top brown. Oh man, I’m so full right now emily. Made this a couple days ago and added mushrooms for some more veg…I’m not sure if it was that or if I needed to let the meat stuff cool, but my meat stuff didn’t really set-up the first night. It did in the fridge though and I’m happy happy happy with my leftovers. A little seasoning salt on top was great! I’ll make again for sure. 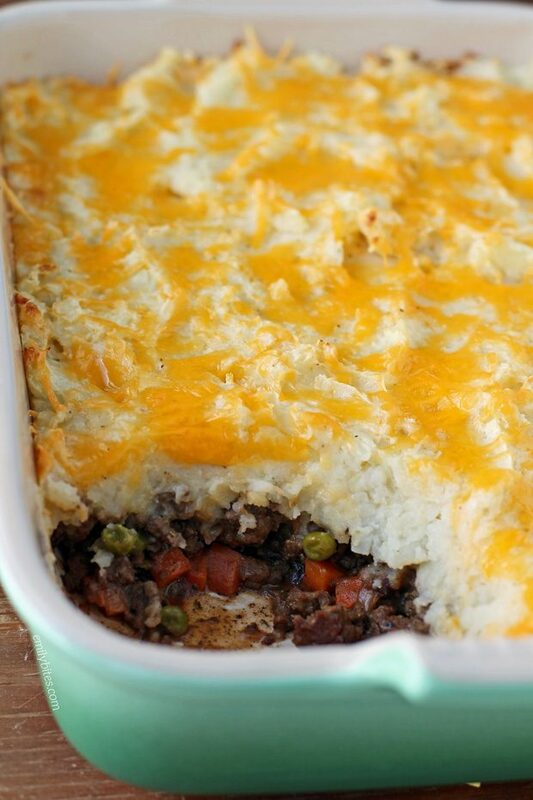 My hubby requested shepherd’s pie – which I had never made. But I knew exactly which website to search for a great lightened up version. This looks so delish! Just got back from the store and am heading to the kitchen to cook this now. Thanks for ALL your great recipes, Emily! I’ve tried a number of them, and each one has been a hit at our house! I almost didn’t read through this recipe because the name of it scared me and I thought there would be cottage cheese in it. I’ll be mskingbtjis. I have all the ingredients. Okay i made this and it is delicous! I used all frozen vegetables because it made it wayyyy easier. I also cooked my potatoes in my instant pot while i did the other part. Mine did not set so i must have added too much liquid somewhere….not sure. Love your blog though and always end up back here for recipes!